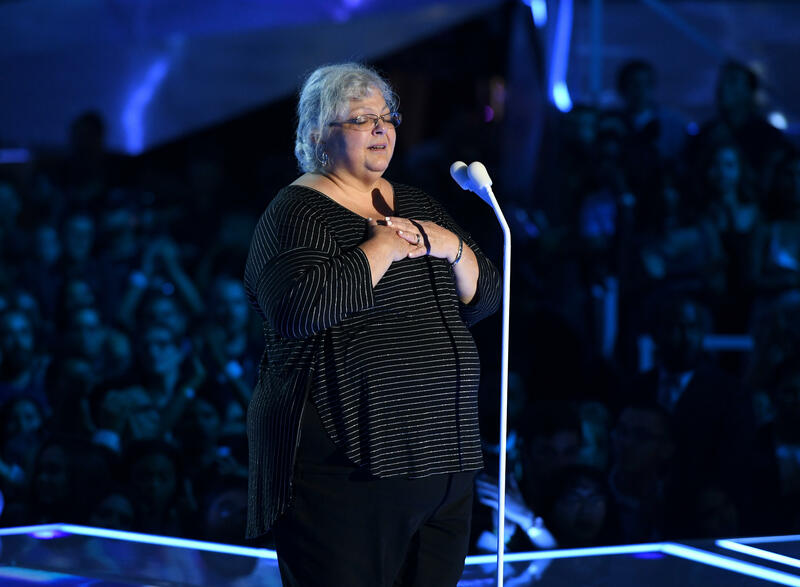 Susan Bro, mother of Charlottesville victim Heather Heyer, spoke at the MTV VMAs and presented the award for best fight against the system. Heyer was killed amidst the Charlottesville violence earlier in August when James A. Fields Jr. drove a car into a group of protesters. Rev. Robert Mead IV, a descendant of Robert E. Lee, made a few remarks before introducing Bro to the stage. He said, "We have made my ancestor an idol of white supremacy. As a pastor, it is my moral duty to speak out against racism, America's original sin. Today, I call on all of us with privilege and power to answer God's call to confront racism and white supremacy head-on. We can find inspiration in the Black Lives Matter movement, the women who marched in the Women's March in January and especially Heather Heyer, who died fighting for her beliefs in Charlottesville." When Bro took the stage, she said of her daughter, "I miss her, but I know she's here tonight. I have been deeply moved to see people across the world, the whole world, find inspiration in her courage." She announced the launch of the Heather Heyer Foundation, which will provide scholarships to "help people join Heather's fight against hatred." Bro continued and said, "I want people to know that Heather never marched alone. She was always joined by people of every race and every background in this country." She announced that MTV decided to honor all six nominees for its category best fight against the system, which were "Black Spiderman" by Logic ft. Damian Lemar Hudson, "Immigrants (We Get the Job Done)" by The Hamilton Mixtap, "Light" by Big Sean, "Scars to Your Beautiful" by Alessia Cara, "Stand Up / Stand N Rock #NoDAPL" by Taboo ft. Shailene Woodley and "Surefire" by John Legend. Bro added, "I congratulate all these artists on their VMA tonight and I look forward to the important work that they and all of you will do together to make the world a better, kinder place. Thank you."